Dumb Question: To App or Not to App? One of the perennial questions discussed in the mobile world over the past two years has been whether mobile apps or mobile web sites will "win" in the end. The media likes to pitch it as a winner-take-all situation where five years from now consumers will predominantly be browsing on devices or using apps, but not both. I've also heard partisan platform vendors pushing this idea. Well, according to the latest data from Comscore's 2010 Mobile Year in Review (free download with registration), the "app or web" thing increasingly looks like a dumb question. Consumers are clearly doing both. "the two activities are not mutually exclusive. In fact, most users that utilize one method use the other. In the U.S., 82 percent of app users also use their browser, while 78 percent of browser users also utilize apps. Only 6 percent of app users don’t utilize their browser, while 8 percent of browser users don’t utilize apps. In Europe, 71 percent of mobile browser users also use apps, while 73 percent of app users also use their browser. 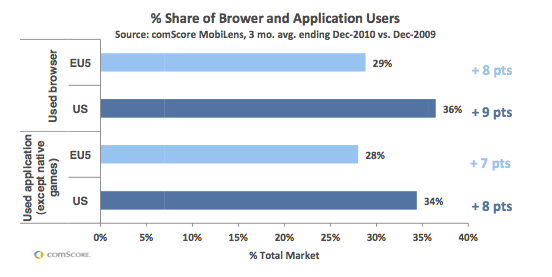 Just 7 percent of app users in Europe don’t browser, while 8 percent of browser users don’t utilize apps. Instead of the browser vs. app question being an ‘either or’ proposition, the mobile web audience has quickly come to expect and utilize both browsing and apps"
Given that consumers are clearly consuming content through both apps and browsers, most brands and media companies are going to want to do both as well. But that doesn't mean that your mobile web site and mobile apps have the same goals or need to be exactly the same. In my view, mobile web sites are best suited for the awareness stage of a consumer relationship where discoverability and low commitment are essential. Once you have established awareness and some level of favorable brand image, you can ask consumers to install your app to keep the relationship going. So apps are more about ongoing engagement and loyalty. We've had a ton of interest in our App SDKs for iOS and Android. But we have had just as much if not more interest in mobile-enabling existing web sites using HTML5 and mobile-optimized templates. And mobile processor friendly technologies like the new Flash StageVideo can make for an even more enjoyable mobile web experience on the growing set of Flash-capable devices. In content-centric marketing and media, it's all about reach and engagement, and that means both mobile apps AND mobile browsers.